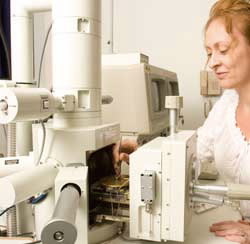 A scanning electron microscope (SEM) allows high magnification and high resolution imaging of the surface of samples. A beam of high energy electrons are scanned across the surface of a sample. Interaction of the beam electrons with the atoms of the material examined produce a number of measurable effects which include the imaging of; surface features (morphology/topography), average chemistry (mean atomic number contrast) and cathodoluminescence (visible light). Compared to light microscopes, a SEM allows for far higher magnification images with a greatly increased depth of field (focusing range). The current SEM is a Jeol JSM5410LV. This is a tungsten gun (electron source) SEM with secondary electron imaging (SEI), backscatter electron imaging (BEI) and a cathodoluminescence detector (CL). The instrument will work in both high and low vacuum modes. SEM is used in any field of research where high magnification imaging in required. Even at low magnifications the technique is often used as the depth of field achievable is far superior to that of conventional light microscopy. Examples include all areas of biological and life sciences, earth and environmental sciences, material sciences, forensics, engineering, manufacturing and processing technologies. Sample size – this is restricted by the physical dimensions of the sample chamber and the stage that holds the sample. Stability under vacuum – “wet” or soft materials may not behave well under vacuum and samples may need to be treated prior to imaging to make them more stable in this environment. Conductivity – beam electrons may build up on a sample creating problems with imaging. If a sample is not of itself conductive a thin surface coating (typically gold or carbon) need be applied first.